I headed out of the tent walking so that I could grab a drink of water and some of the (disgusting) sunscreen from the volunteers. As soon as I was done with filling those needs I started my run. My plan for this was to do a 5:1 run walk. What that means is that I would run for five minutes and walk for one. I knew going in that I would probably not be sticking to this exclusively, but if I could try to hold myself accountable to the watch, I would get it done faster than if I just ran when I wanted to and walked the rest. Just a little run to the oval. My plan started out pretty solid. I was feeling ok and while running for 5 minutes at a time was seeming to last an eternity, I was at least running in a forward direction. Let me say that while the run of an Ironman is never “fun” per say, it was a bit fun for me as I was starting to be able to see and interact with all of my friends who were out on the course racing along side me. I cannot begin to tell you how many “hey! you’re looking great’s” I heard from the other direction or the number of times I stopped mid run to get a big old hug from someone who was accompanied by “we’re doing this!” In full disclosure, some of those hugs may have been preceded by me saying something along the lines of please don’t squeeze me too tight I’m not feeling great, but I gave out hugs just the same. Through the first 11 miles I was pretty on target with my goals for myself. I was feeling ok, keeping the run walk mostly to the schedule and holding a pace that I could live with. At around mile 12 I started to feel that the wheels were coming off the bus a little bit. I was in need of a bathroom and of course at the one time you need one they’re impossible to find. I had to slow to a walk until I found one. I got to the turn around point on Mirror Lake Drive and was really bummed to learn that there was not one there and that I would need to head back almost another mile before there would be one. At this point I passed my training partner, old coach and good friend, Jessica heading to the same turn around point. She indicated that she was going to catch up to me and then walk a bit with me. She did and we found a bathroom at an aid station together. We continued to walk a bit in hopes that my stomach would settle. We chatted about how crazy the events of the day had been thus far. It turned out that I had fared better than her in that she had some issues with her watch, experienced some close calls on the bike with crashes and thus far the race was pushing her to her mental limits. After heading back out-of-town I had started to feel better and was ready to start running in intervals again so we did. At this point we were both feeling a little beat up. Jess started to struggle with how she was feeling. And while I was feeling some better I told her that I would stay with her until she bounced back. As the miles stretched we continued some semblance of a run walk. We eventually caught up with Ben who was walking the entire 26.2 marathon stretch due to injuries he had sustained earlier in the season. Kudos by the way for walking that far. It stinks for sure. We stayed with him for about a half mile and then went back to our run walk. Unfortunately it wasn’t long after that the wheels really came off the bus for Jess. It’s tough to say what the cause was but any number of things can impact your day during Ironman. She felt woozy, dizzy and just wasn’t sure she could continue so she told me to go on ahead. 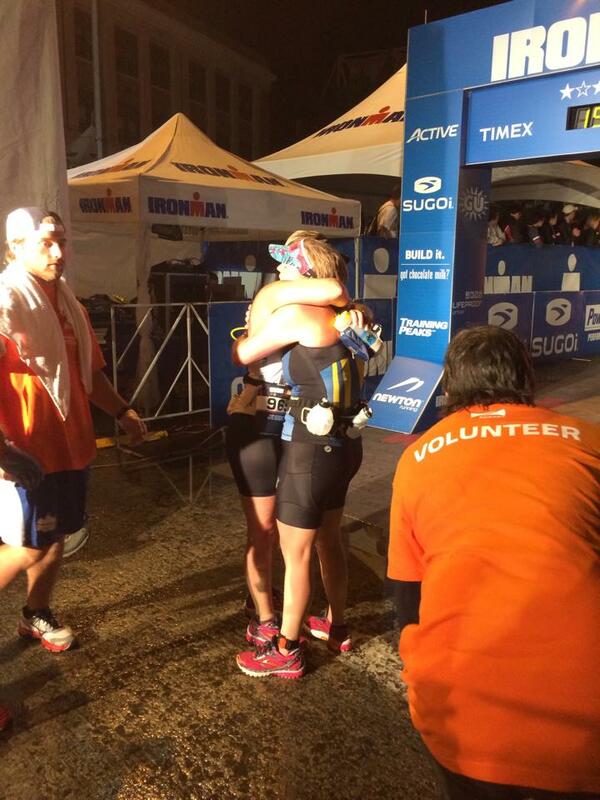 In that moment, I decided that whatever it took my only important job for the remainder of Ironman was to get us both to the finish line. I told her that I was staying and that there was no need to keep shooing me ahead. So we walked and we ran when we could. There wasn’t a lot to say for those last six miles but we kept on heading towards the finish line together. I have to say that it got a bit dark out there but it was never all that lonely. We continued to pass folks that we know and gather up hugs where we could. I may have done some singing and I know I did some thanking of the volunteers. I figured if we were going to be out there I might as well have what fun I could even if it was in my own head! So I smiled, I encouraged people as I could and we kept at it. Eventually we made our way back in to town for the final couple of miles. At this point we made the running a bit more frequent as Mike Reilly was calling at the finish line and I was anxious to get into that oval. Geez, when you hit that turn around on Mirror Lake Drive and head back home to the oval, there’s really no words for what that feels like. I was telling people as we passed that I was going to be and Ironman. I was completely overwhelmed with emotion. We made the turn into the oval and I remember thinking to myself that this is exactly what I had been waiting for and that I had been working for a long time to get to this very place. As we ran around the oval, I was amazed with how you really couldn’t see or hear anything. The place was a blur of lights and people at 10:00 PM. I was just so ecstatic that I had made it. And I will be honest… hearing Mike Reilly call me home made it all worth it. 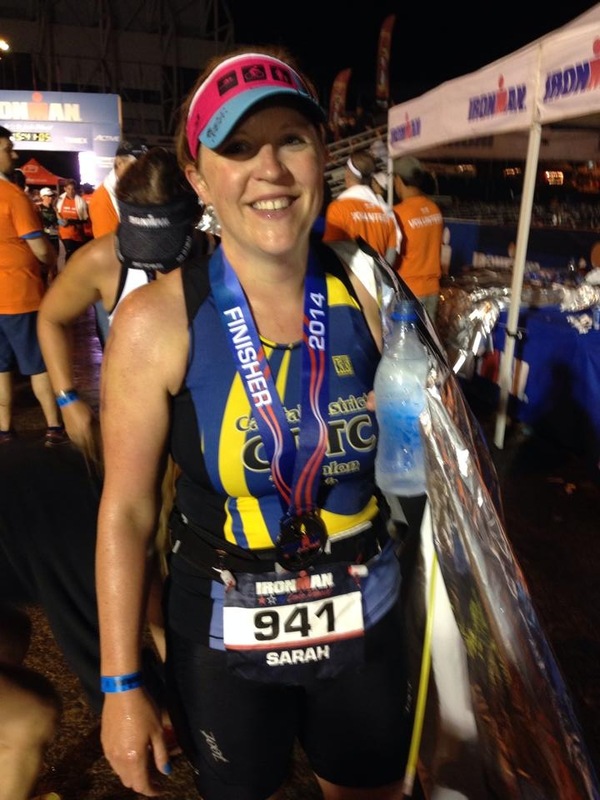 Because indeed Sarah Fisk, You are an Ironman. Right after the finish I can admit that there were some tears. 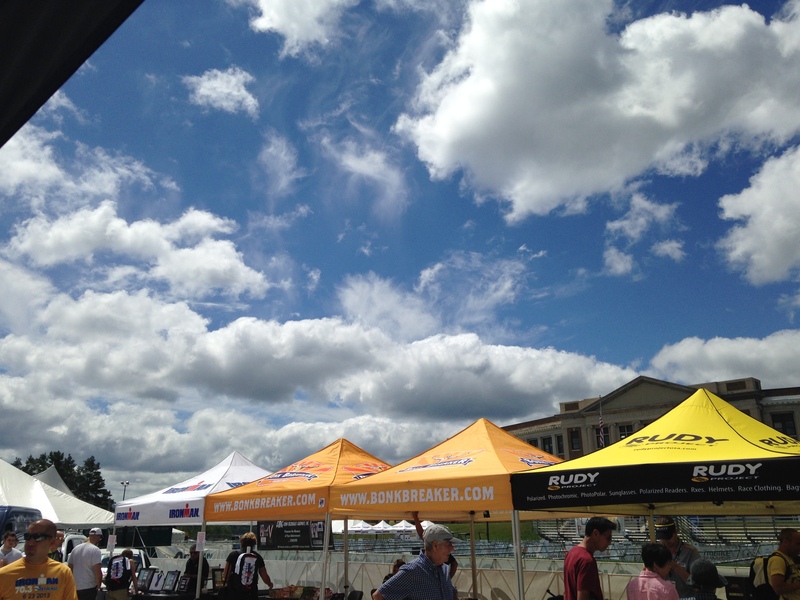 It had been a wild and crazy day in Lake Placid and we were thrown so many curve balls that we were not expecting. But at the end of the day, no matter what we were thrown we kept on going and finally after a couple of year of hard work, I can say with pride that I am an Ironman. Outside of raising a pretty amazing kid, this accomplishment may be one of the proudest moments of my life. I worked hard for something and I committed myself to getting it done. I’m done with the actual race report, but I feel like there’s more to say in concluding this epic race and this journey. So I will wrap up with my IMLP final thoughts in another post. But for the conclusion of this one my final race time (which is altered to not include the second loop of the swim or T1) was 14:29:45. I’m pretty proud of that considering the day we were given and that my only real goal heading in was to finish in under 17 hours. And while in the moment, I said I would never do another one…. I can now safely tell you that I will indeed be back. 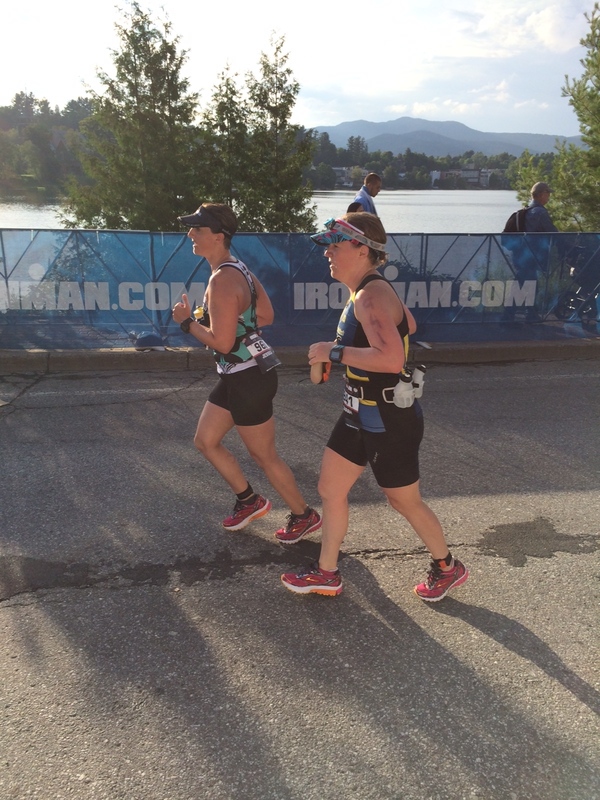 This entry was posted in Ironman, Ironman Lake Placid, Race Report, Running. Bookmark the permalink. Awesome ,you did great !